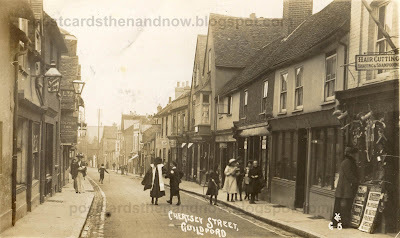 Guildford, Surrey, Chertsey Street circa 1910. We can see two old pubs in this postcard by Young & Co of Teddington. On the left-hand side of the street, The Dolphin Inn and over the road on the right-hand side the wonderfully named Leopard Inn. The only pub to be seen in the modern Google Street View is the big building that occupies most of the left-hand side, the not so wonderfully named Slug and Lettuce. On the left-hand of the postcard you can see a sign advertising a 'Fish Supper Bar'. Notice that a couple of the children in the postcard have a stick and a hoop. These are what children used for amusement before the days of iPods and PSPs (whatever they are). For more old pictures please visit Sepia Saturday. As always, click the postcard to enlarge. Don't you just love that Google map. Yes the children were out and about and very active at one time. So many changes. Love that photo. Once again you have chosen one of my favourite scenes, a street with people actually going about their business, and best of all, children with hoops! I wonder what the lady on the right, peering into the shop window, was contemplating buying. I've walked down that road some years ago. But it's the postcard that shows the road once had charater of its own. The lady on the right is looking in what appears to be a hardware shop - there are tools and bicyles hanging up outside. As there is a billboard advertising fireworks I onder whether it is a seen from a November day. Oh what a lovely spot....even beginning at the name...and yes Google maps IS wonderful! Love this post...I always enjoy your then-and-now shots. I must have walked down that street a few times but certainly not down the middle of it, as they are in the postcard. Dolphins and Leopards sound a lot more appealing than Slugs and Lettuce. I have never heard of a "fish supper bar" and I'm wondering if they meant fish and chips. Fun to see it then and now. 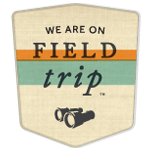 Wonderful photo card! Could even be from 18th or 17th century. Thanks for the link to deadpubs.co.uk , a most unusual resource that I put in my bookmarks for history research. Lovely photo. I think the lady is looking through the window of Messengers Hardware Shop!